There has been so much happening in the studio that I've barely been keeping my head above water. As you might have noticed, this is the first post in many months! The studio has moved twice in the past 8 months and I am happy to say that we are here to stay- at our new home in Fort Worth. The studio is up, ready, and rocking, and there are LOTS of designs on the bench. Sabrinah Renee, boutique jeweler was invited to participate in NEW YORK FASHION WEEK 2014 with Emerging Trends. This group put on an amazing runway show at Boston Fashion Week last October, and I am proud to be a part of their debut in NYC this September. The date is coming up quick and there is lots to do, as usual. I've decided to make some huge, bold, stop-you-in-your-tracks, off-the-wall pieces that will grab attention from the front to back row of spectators at the show. I have some great new ideas that include a lot of agate and a mixture of precious metals, including some GOLD. There will be lots of metallic stones like hematite and pyrite, and some copper as well since I have been so recently captivated by its beauty. Copper may not technically be a precious metal, but is precious in my books! Keeping me company in the studio has been the history channel, with many shows about space exploration. 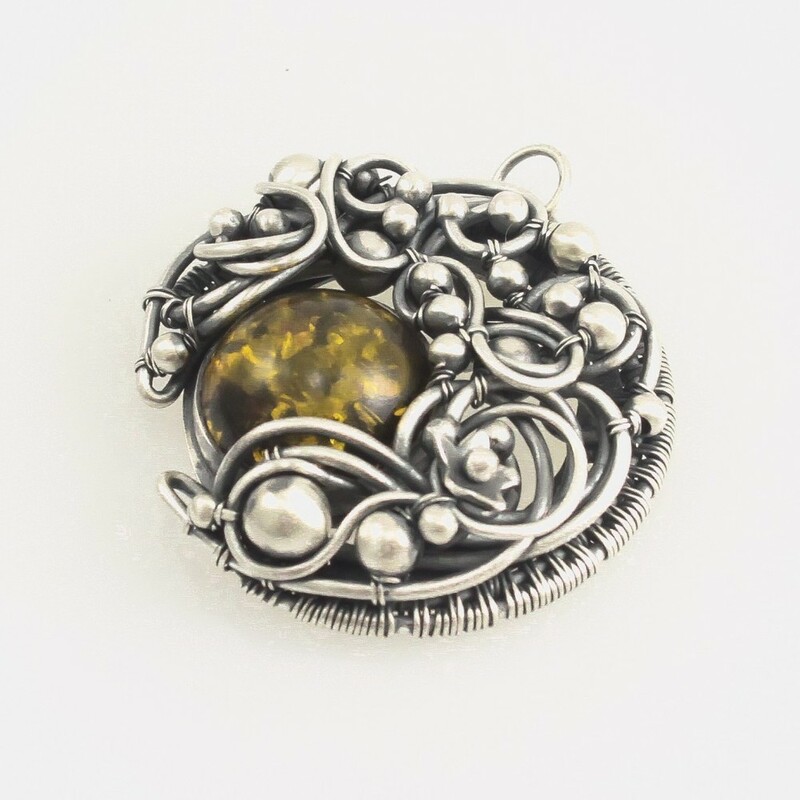 This is an interest of mine and has been great inspiration for some of my latest pieces, including this "Lunar Eclipse" pendant with a gorgeous green Amber gem. I plan to be more active here on my blog and website, so please keep watch as my newest ideas and pieces take form!